It's May! There are so many precious and long-awaited sequels coming our way this month. Three of my favourite series have their final books coming out this month which is obviously extremely exciting. I think I'm being a little bit ambitious with this months TBR since I do have school, but I still plan on getting as much reading done as possible. Knowing me I'll probably only get around to reading three books, I have an awful tendency of completely disregarding my TBR lists. This is the second and final book in the Reboot duology. I read the first book, Reboot, last year and I thought it was a really unique and interesting take on a dystopian novel, with zombies! But not the brain-eating beasts that you'd usually affiliate with the word zombie. I absolutely loved Reboot, I thought it was incredible and action-packed. I can't wait to see more of Wren and see how her story ends. Rebel comes out on May 13th! This is the third and final installment in the Selection trilogy. I started the series last year and absolutely loved the first book, the Selection. I thought the premise was incredibly interesting and I was very intrigued by the plot. I was a little bit disappointed with the second book, The Elite, but I am hoping that alot of my issues with it will be resolved in The One. I'm really looking forward to learning more about the Rebels and of course who ends up with the charming Prince Maxon. The One comes out on May 6th! I've been absolutely obsessed with the Lux series ever since I started reading them late last year. I find them really quick and enjoyable and particularly easy to pick up and finish in a couple of days. I was so surprised by the ending of the third book, THAT CLIFFHANGER THOUGH. I really just need to know what happens next. I've had this book sitting on my shelf for a few months now and I haven't gotten around to reading it. I've heard really mixed reviews about it so I've been skeptical for a long time, but recently a friend recommended that I read it and I thought I'd finally give it a chance. The movie adaptation is also coming out next year, so that's a bonus! I'm sure this series doesn't need an introduction, almost everyone has heard of the Mortal Instruments. City of Heavenly Fire is the sixth and final installment of the series and is coming out on May 27th. I absolutely love this series and am so sad to see it come to and end but I need to know what happens next even if it will break my heart. I'm not emotionally prepared, but I will be when the time comes. I am DEFINITELY going to be buying this the day it comes out. Also, this book is a monster! It is 733 pages long, so I probably won't be finished with it until sometime in early June. I've heard really incredible things about this book, and I've been reading alot of contemporary lately. I read the premise of this book a few months ago before it was released and it just sounds like a very beautiful, light and sweet contemporary read. Something right up my alley! Gayle Forman is one of my favourite authors ever. Just One Day is one of my favourite books ever, and Just One Year is just as good! I re-read Just One Day last month and also started re-reading this. I love this series so much. Words cannot even attempt to describe how much I feel about these books, and all of Gayle's books in general. 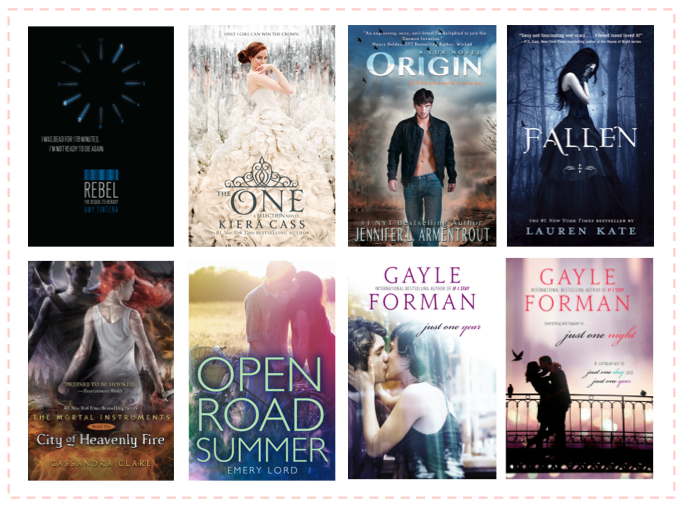 SUPER EXCITING: Gayle announced that an novella called Just One Night will be released on May 29th!! Both Just One Day and Just One Year conclude rather abruptly and I thought that I might never get to know what happens on the other side of that door, but it is happening. IT'S HAPPENING AND I COULD NOT BE MORE EXCITED. This TBR is really flexible, I probably won't get around to reading all of these, and what I do read will depend solely on my mood. I'm aiming to read three books this month at the very least.